Wow this week flew by for me. I was busy out and about all week and tomorrow I am going to a friends house who is selling EVERYTHING including all of her art supplies. I have been trying to keep up with the pace of leather art. I did not get a sketch this week. Well I did but I didn't like it. So I worked on some paintings for another show I am doing in June. Lot's going on for me. Thank you to Eva and Kristen for hosting Paint Party Friday. I look forward to seeing what all of you have created too. For me my art in my favorite genre, abstract, including my leather piece. Hope you enjoy them. Have a nice weekend and happy Easter. There is lots of texture in both of these paintings. This piece measures 22" across and 6" deep. I so love this piece. 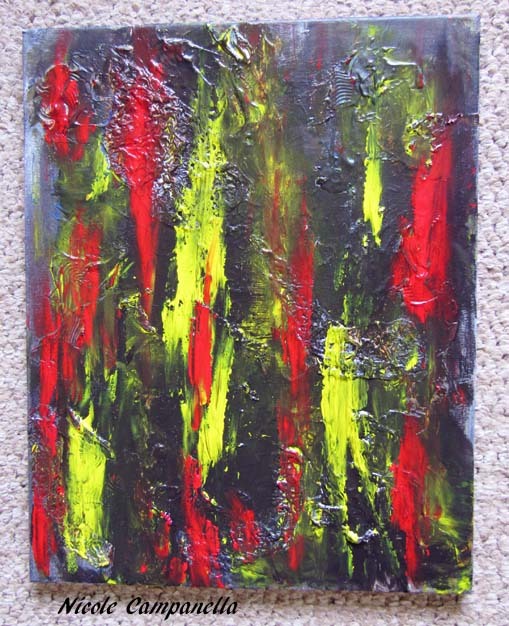 Gorgeous abstracts, Nicole. The leather bowl is simply awesome. 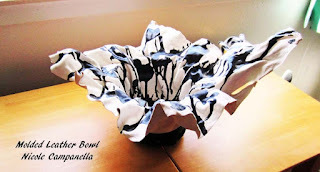 I do love your bowl..and beautiful art this week! Wish I could reach in and touch the abstracts- fabulous, as is your unique bowl! Happy PPF, happy Easter and weekend too! Wow! I hope you found some amazing art supplies you can use! Very cool bowl! Wow busy beaver.... sounds like a lot of fun though!! Wonderful work and I enlarged the paintings on my computer to see the great texture!! Have fun and Happy Easter! Wow, the texture in your abstracts is gorgeous! I love the leather sculpt piece as well. Have fun visiting your friend! Love the texture in your paintings. You used the colours of the Belgian flag in it :-) (except for the green in the first one). That bowl looks awesome. Happy Easter to you! love the paintings and the leatherart. Actually made me think of a hat. :) Beautiful! I so enjoy the beautiful art you real artists create! I'm working on a silly ketch, but it's not quite ready! That first painting in particular looks like a cool surreal landscape. Maybe a little spooky! I guess I like to find images in abstract work. 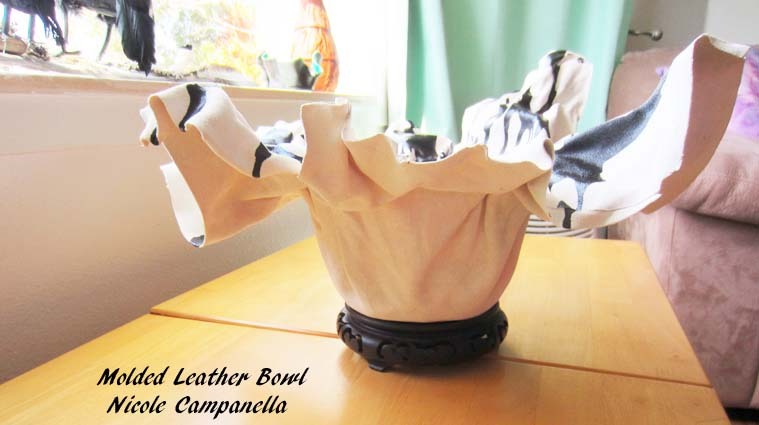 :) The molded leather bowl is too cool! Gorgeous textures and that leather bowl is beautiful - so dynamic and love it in black and white - Happy Easter! Your paintings are so cool!!!! 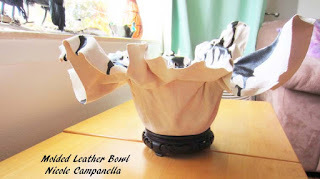 But, I have to say, that leather bowl is breath taking! Wow! Hope you had a great Easter! Big Hugs! 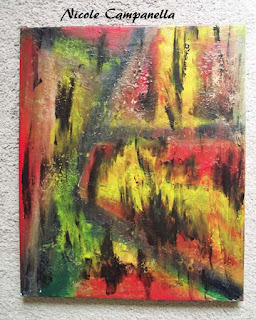 Your abstract paintings a wonderful! So colorful and full of energy. The molded leather is fascinating. All your artworks are WOW! 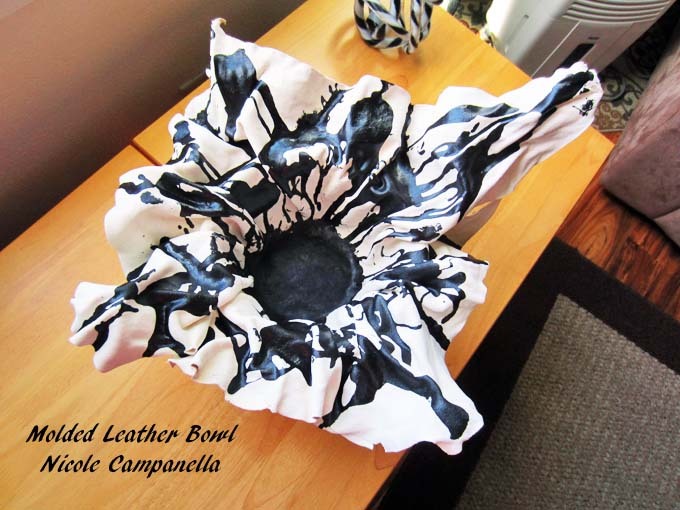 That black and white leather bowl surely a great piece for a room decor. All your artworks are WOW! 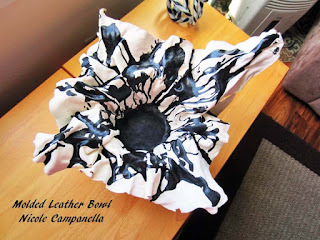 That black and white leather bowl is surely a great piece! Love it for interior decoration.